4 bedroom, 3.5 bathroom villa in the Glenbrook community. Owned by sharon ogden. Ref: 3232. 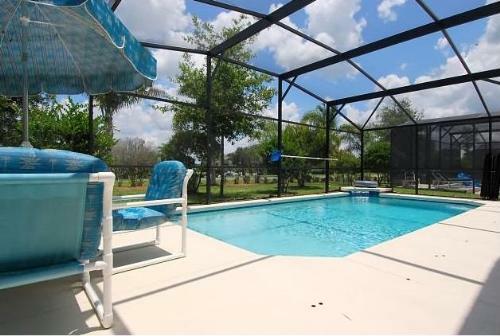 Executive Villa only 8 miles from Disney so close you can hear the fireworks. 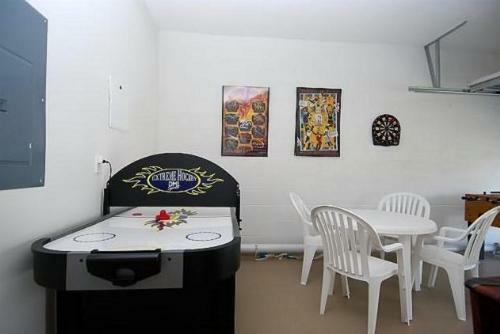 Quality games room with 8 ft slate pool, Air Hockey, Bar Football, Darts. 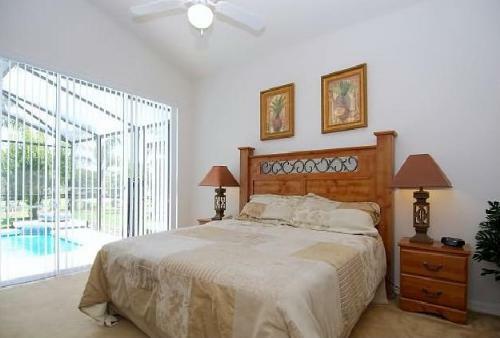 Two Master Bedrooms 1 King, 1 Queen both with en-suite bathrooms & walk in Closets. We are Sharon and Jeff with two boys Clay and Josh living in Stockport Cheshire. I have been a clerical worker all my life and currently work for the Civil Service, Jeff has been a self- employed plumber since leaving school all those years ago. We started holidaying in Florida back in 1987 and used to tour quite a lot, we loved Disney and the Parks. We went back with friends a couple of years later and then again after our son was born in 1991. We took our second son when he was born and started to wonder about a buying a place out there. We had always stayed in hotels but in 2004 we put a deposit down on our villa in Glenbrook, we specified we would like an open aspect at the rear as we did not want to be overlooked by other villas, we also learned that the road would be called Morningstar Drive, that cut the deal for us. We chose all the interior/exterior design, paints and tiles worktops pool tiles. It took 12 months to finalise and build then it was ours. We work really hard at keeping our villa clean and up to date, I think we must love DIY as we are always replacing, painting, ripping something up, upgrading things making sure our place is in great shape for both our family and our guests. We have recently replaced all the carpets with porcelain floor tiles making it easier to clean, created a bar in the games room, (great addition for the kids), added window treatments, new pool blanket roller, painted the outside of the villa and some of the rooms inside. Replaced the cooker. Replaced two of the sun loungers, painted 3 of the bedrooms, added ceiling fans to both the twin rooms, added new bedside clocks so we can charge our phones without a plug just bring your USB. New bar stools in the kitchen area. Desk with a printer. New pool towels. 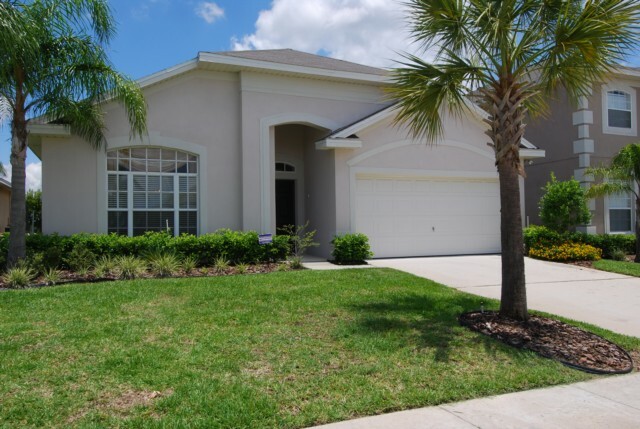 When you look for a Florida Villa what do you look for? When we had our villa built we wanted a spacious feeling for the family room where you can relax, at the rear not to be overlooked by other villas. Our very own games room, 4 bedrooms and 3 bathrooms. We achieved all of this and more. Our spacious family room with high vaulted ceilings combined with the dining and kitchen in the heart of the villa, make this all possible for our family and yours to enjoy. Our 4 bedroom 3 bathroom villa has everything you need to enjoy your vacation. Our beautiful pool is there to help you relax after a long day at the parks or whilst having a day off to take in some sunshine. 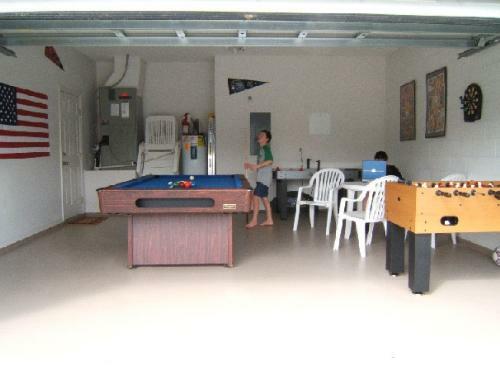 Let the kids enjoy our games room with 8 ft pool table, air hockey, bar football, darts, and table with 4 chairs. This prestigious community, with attractive palm tree lined roads also boasts a community clubhouse with pool,tennis/volleyball courts, media room, internet access with 2 computers and wireless hotspot (for those with laptops). Also a gym, billiards and air hockey. Our clubhouse is manned every day so you can get valuable information and advice when you need it from a friendly person. 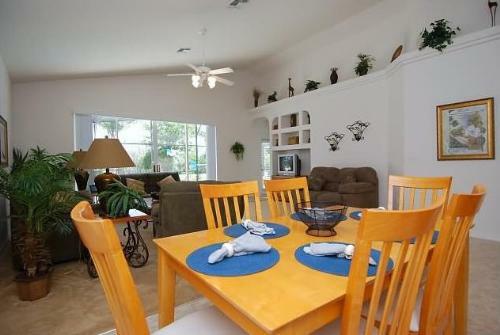 Why stay in an Orlando hotel room when you can enjoy the comfort of our superb villa? Our luxury, fully air conditioned villa with ceiling fans, offers all the benefits of a home from home. With 4 bedrooms and 3 baths, fully equipped kitchen, games room and screened pool, playstation, safe, alarm, all linens and pool towels provided, hairdryers in all bathrooms. Our spacious living area seems even larger with the use of lightly coloured decorations. The Master has a king size bed, walk-in wardrobe, bedside cabinets, large dressing table and mirror cable T.V. 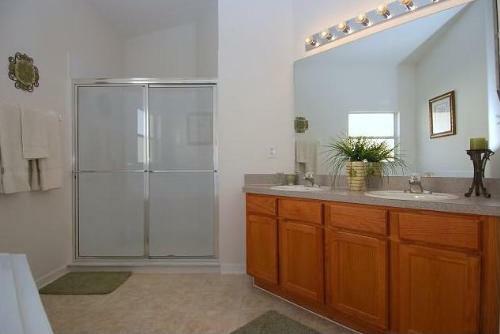 The en-suite features his & hers sinks, bath with separate walk in shower. Overlooking the pool, what a great view when you awake! 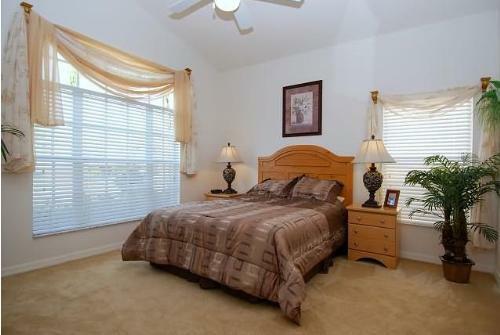 Master 2 is a large room, this features a King size bed and large walk in wardrobe closet. The en-suite is also large and has both a bath with separate walk in shower unit and separate toilet. 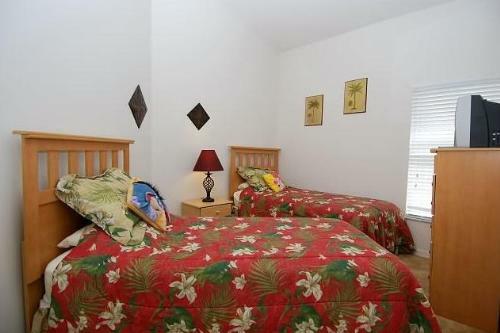 The remaining two bedrooms are both twins with 2 beds and large wardrobe closets. 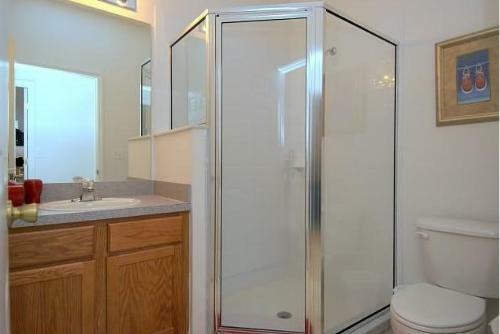 Both rooms are served by the remaining bathroom with a walk-in shower. 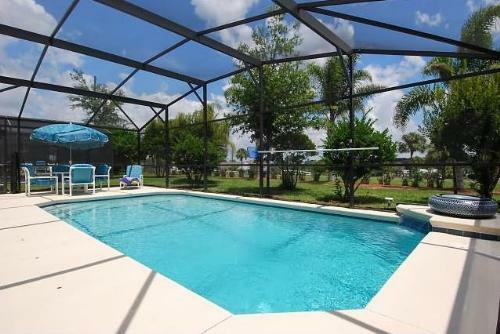 The large 13 x 26 pool is ideal for relaxing and cooling off. Pool heating (recommended October to April)is available at extra cost. The deck area is fully screened and is surrounded by colourful shrubs. Another benefit we offer is that we have no neighbours to the rear overlooking the pool. The pool furniture includes 4 deluxe padded chairs, table and 4 loungers. Inside there is a large living area with 3 comfortable sofas and an an armchair. One of the sofas is a double sofa bed. With an entertainment unit containing HD TV , playstation, dvd, vhs and a stock of films and games, if you need more try our wonderful clubhouse. For those with laptops we have our very own broadband so you can keep up with those important e-mails, we have provided a printer and a desk to put these on. 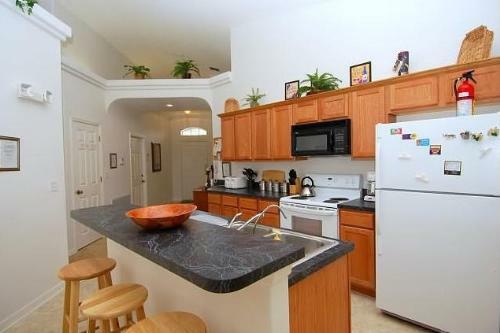 In the kitchen, we have all the appliances you need, cooker, microwave, dishwasher and fridge/freezer. The sink includes waste disposal. All crockery, cutlery, utensils and glasses and plastic-ware are provided. Every bedroom has a cable television. 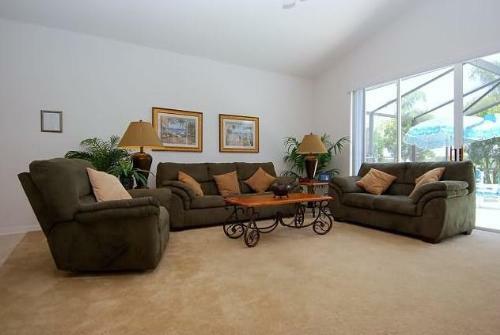 A large TV and DVD player are situated in the family room. Music can be played through the CD stereo if preferred. Children are very welcome. Please ask for anything you need. There is a cot, high chair, car seat, stroller and lots of extra sheets towels and blankets are available. The health and safety of our guests is paramount. We have everything you would expect from a newly built Villa. Smoke detectors are fitted throughout and back-up with a fire extinguisher and emergency lighting. The windows all have locks and all exterior doors are fitted with deadbolt locks. A security safe is provided for your valuables. We also have a monitored security system. The laundry room has a full size washing machine and dryer. An iron and ironing board is situated just off the kitchen area. 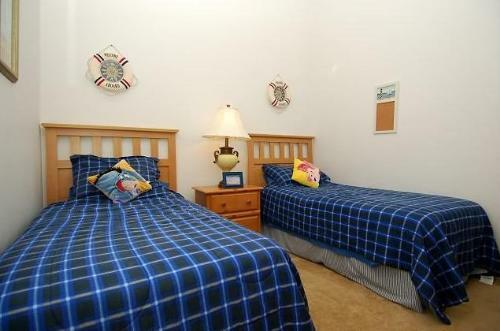 All bed linens, towels and pool towels are included. 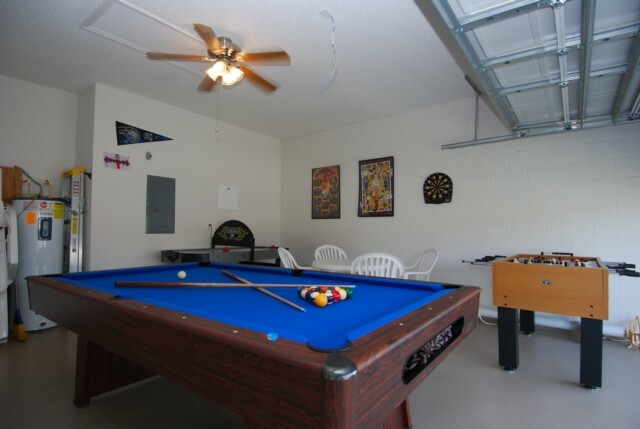 Available for our guests use is the Resort clubhouse offering free use of a number of recreational activities. 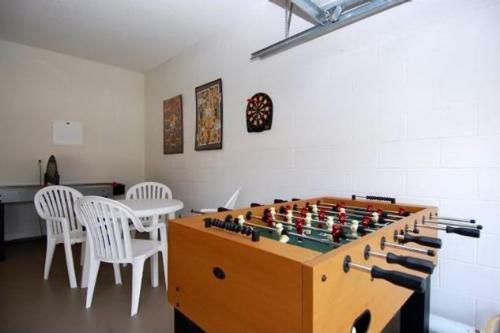 These include, a large community swimming pool, volleyball, tennis, pool table, air hockey, large screen T.V and movies, computer with internet access (hotspot for laptops),and if your feeling really energetic after the parks there is also a gym. You can get games and DVDs. Look out for the notices as there are various activities including meet and greet events. Our Management company is a local family who are on hand 24hrs a day to offer any assistance you may require. Your enquiry will be sent to villa ref 3232 only. This page has been viewed 31256 times since 16 Dec 2006.